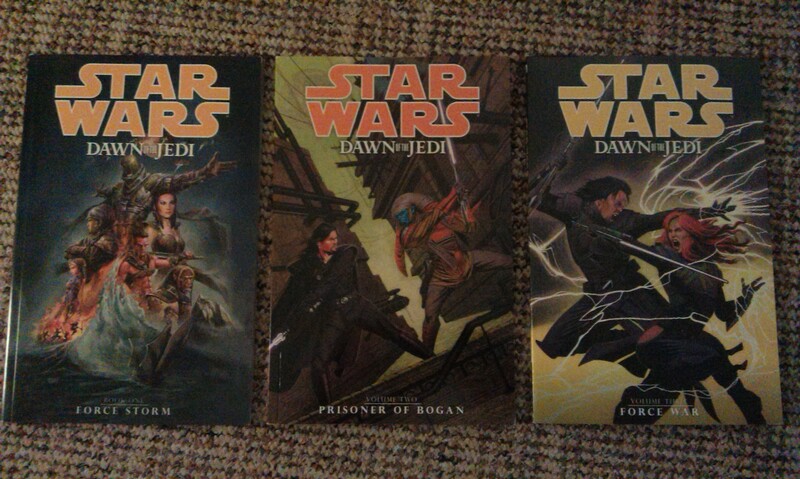 After a couple of weeks with various Warhammer novels, I’ve returned to Star Wars, and the dim and distant past of that universe – Dawn of the Jedi! Set over 25,000 years before the events of A New Hope, the comic series tells of the mythic origins of the Jedi Order, as Je’daii on the Inner Core world of Tython. I’d been looking forward to these books since publication began in February 2012, though have only now got round to reading them – shocking, I know. From the Dark Horse dream-team of John Ostrander and Jan Duursema, who are responsible for some of the most awesome comics in the entire history of Star Wars publishing, I had high hopes, but I must admit, having read the first arc, Force Storm, I was left feeling a little disappointed. Let me explain. Star Wars is, of course, science fiction, and so requires a reasonably high level of tech in any story being told. The danger of doing prequels in these circumstances is always to make the tech side of things not as advanced as the original, and yet still sufficiently advanced from our own society. The prequels famously got this kinda screwy with a whole host of aspects, and only vaguely tried to write it off as comparable to art deco before the cheap mechanical era of the 40s and 50s. The original Tales of the Jedi series managed to pull this off to an extent, with having its powerpack-fueled lightsabers, but the later Knights of the Old Republic still managed to incorporate some technology that, undoubtedly, looks really cool on the page, but looks much more advanced than the stuff we see 3000+ years later in-universe. From the off, Dawn of the Jedi features some ships and droids that don’t look all that different from prequel-era and classic-era ships and tech, which instantly destroys the conceit that this story is taking place over 25,000 years before those eras. Even accepting that the Rakatan Infinite Empire was a race apart in the tech stakes, the Je’daii still have some nifty stuff that Luke, or Han, would be familiar with. To me, this either assumes that (a) there was little-to-no technological development over the subsequent 25,000+ years, or (b) this is a badly-designed comic, which has sacrificed any historical aesthetic for the sake of “being Star Wars”. Personally, I would have assumed something set 25,000 years before A New Hope would be like a Stone Age society. My historical gripes aside, the story isn’t too bad. The execution suffers quite a lot from being overly expositional, but you really can’t hold that against it, given the trail we’re blazing here (just a shame the visuals didn’t match up – okay, okay, I’ll stop griping now). We have a really compelling tale of Eye of Palpatine-like constructions floating throughout the galaxy herding up Force-sensitives to take them to Tython. Concentration Camp analogies aside, we don’t hear anything about how this worked – were the Tho Yor spaceships sentient? How did they find the Force sensitives? Just what was going on? At any rate, the ships deposited the Force sensitives on Tython, where they formed a society that, over the centuries, developed into a whole solar system of peoples. I was a bit baffled by this – my physics is rudimentary at best, but I thought there was an optimum distance from a solar body for life to exist comfortably. We have at least three planets in this system that support life with no mention of specific habitats being developed to facilitate this, so I was a bit confused by all this. I realise I’m being really down on this book – so I shall move on to the good stuff! The main story is actually really interesting. The Rakata, who you may remember from the Knights of the Old Republic video games, trawl the galaxy searching for Force sensitives to “reap”, and following their harvest of the lush world of Tatooine (clearly a shout-out, and quite cheesy at that), their attention is turned to Tython and the Je’daii community there. The Force Hound, Xesh, is sent to Tython, very much in the manner of the Silver Surfer, but ends up in a confrontation with three Je’daii Journeyers, who I assume are being set up for a starring role later in the series. These three – a Dathomiri, a Twi’lek, and a pureblood Sith – follow the pattern of almost every major Star Wars series, of having a leading trio. Something that really grated on me was all that “princess” nonsense from the Dathomiri, Shae Koda, which I feel was obviously meant to be a throw-back to the by-play of Han and Leia – but, what the hell?! Anyway. It’ll be interesting to see if and how the dynamic of these three is developed. The planet of Tython has several distinct areas, and feels quite nicely developed as a world. The Je’daii community has built a series of temples on the planet, which serve as something of a training ground in different disciplines. This aspect of the story is part of something that I really caught onto in this tale. 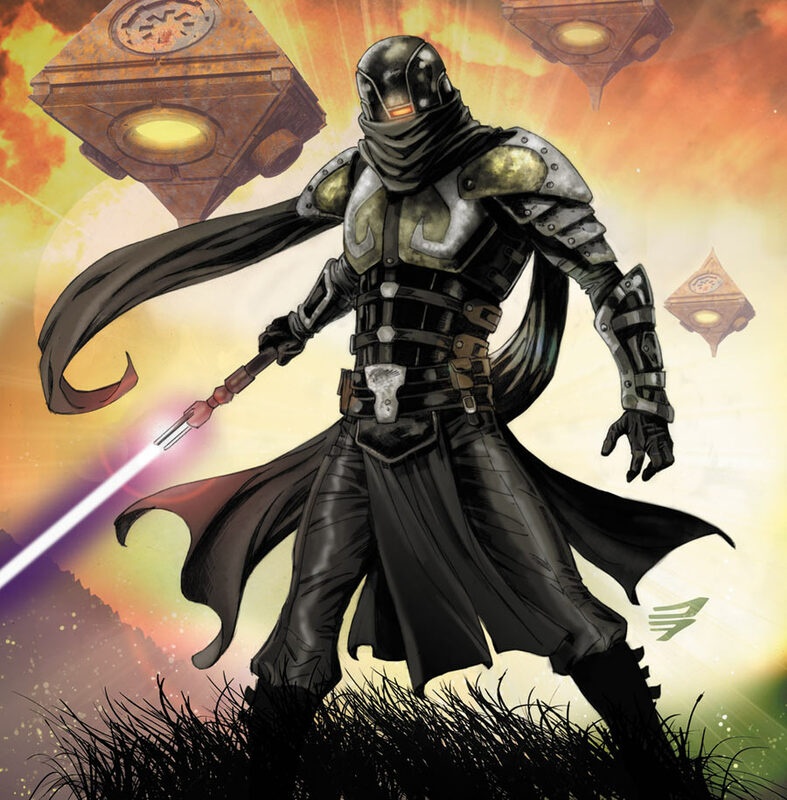 The Je’daii community has almost the feel of an eastern culture to it – I hesitate to say samurai, of course, but there is a definite feel of that kind of thing to it, which is precisely what the ancient origins of the Jedi Order should have, in my opinion! I really hope we get some more of that in later issues. There are also ties to the meta history of the Jedi here. Fans may know that George Lucas originally had ideas for the light and dark side to be called the ashla and the bogan, which here are the names of the two moons. The core tenet of the Je’daii philosophy is to achieve and maintain balance, not to be too dark, nor too light. If a Je’daii goes too far into the light, he is sent to Ashla (the moon) “to meditate on Bogan”, and vice-versa. An interesting concept, and already there is some conflict being set up, as we see an exile on Bogan with a strangely scarred face. Previous Previous post: On the hunt!